You too could be wearing one of these if you can come and help marshal the Moyleman, an off-road marathon on Sunday 15 March. If you can help, contact me: tom.roper@gmail.com and come to the marshals’ briefing at 8:45 on Sunday at Wallnds School, Gundreda Road, Lewes. It's a glorious route, going from Landport Bottom to Blackcap, across the A27 at Housedean Farm, then up to Castle Hill, and down to Death Valley and the Yellow Brick Road, across the Ouse at Southease, up Beddingham Hill, Firle Beacon and Bo Peer, down to the Old Coach Road and back to Firle past Alciston and Charleston, over to Glynde, and back to Lewes over Mount Caburn. It finishes by Harveys Brewery, who have kindly agreed to provide free beer for runners and marshals. Entries for runners have now closed but you can still be part of the Moyleman experience by marshalling. Last Saturday I took a phone call. It was Mo Farah. He'd heard I wouldn't be running this year's London marathon. In a voice cracking with emotion, he pleaded with me to reconsider. Gently but firmly, I refused. 'No, Mo', I explained, 'I've had my day. It's time to hand over to a younger generation'. So while Mo ran his extraordinary debut, I contented myself with a little over four miles on Seaford Head, the longest distance I've run since 9 February. Watching the London Marathon on the television, and the Channel 4 programme on the Brighton Marathon shown the day before, I felt myself falling under the spell of the distance once more. Today the fifth Brighton Marathon took place, and I marshalled, which is possibly not worth a blog post, in itself—except that it is such an extraordinary experience to witness, and play a small part in, such an event. An early start, out on the course, erecting barriers and directing runners to the start. I was given a fine marshalling place, on the Level, at a point the runners pass three times in the early miles. Congratulations to all who took part, in particular to the sixteen (we think) Seaford Striders who took part, and to two of my librarian colleagues, James Mullan, aka the Running Librarian, and Jo Wood, who both achieved personal bests. I only spotted a couple of Striders but it is hard. Looking at the times, my own of 4:46:52 in 2011 and the remarkably similar 4:46:12 in 2012 look rather poor. Then home, and, in spite of some tiredness consequent on getting up at four in the morning, about the time my daughter returns from the night club, I went out for a brief run. Knees hurt, but I begin to see this in perspective. Perhaps I’m a little cowardly with pain. Could more marathons be possible? 3 May: a ParkRun. I have three to choose from, Brighton, Preston Park or Eastbourne. That will not give me the eight races in the Grand prix I need for the Seaford Striders Grand Prix competition, there being only three more after it, but better to take it slowly, I think. if the title of this post needs exegesis, it is the name of Kate and Anna McGarrigle's second album, released in 1977. I don't dance. Haile Gebrsellasie ran the Berlin marathon in 2:03:59 in 2008, a record that stands. Peter Some won the 2012 Brighton marathon in a time of 2:12:03. I finished it in 4:46:12. By comparison you might find that unimpressive but I'll have you know that was forty seconds faster than last year. Indeed, though this was my twelfth marathon and I am now fifty-seven years old, this was my fifth fastest. It has tremendous crowd support, a huge field of runners and the sea. I arrived at Preston Park at around 8:30, with only time to leave my bag, relieve myself and join my starting pen. I failed to make contact with anyone I knew at the start, but, misanthropic as that may seem, it may have been a blessing. It's easy to be overstimulated at the start of a marathon, and above all I wanted to avoid going off too fast. I had decided to use the metaphor of a symphony, of four movements, for this race, and the first movement was not to be taken too fast. At the very start my ankle hurt, but as I ran it loosened. I found myself, by accident, with the 4:30 pacer and stayed with him until more or less half-way. As each mile past he led his group in a cheer, to the surprise of the spectators. I noticed a loutish tendency on the part of some runners to throw half-finished drink bottles to the side of the road, careless of whether any spectators might be standing there. After the run out to the east, the route returns to the centre of the seafront, and then off to Hove. I lasted well until the end of the long run west up New Church Road, including a new excursion into Portslade. After we turned to run back down New Church Road, I began to weary and, at the next drinks station, found myself pausing to drink. This was necessary in any case, as I had some difficulty with the water pouches handed out, which either fail to deliver any liquid at all, or squirt too much and choke the thirsty runner. Then out to Shoreham power station, the so-called road to hell. By the time we turned, and ran back westwards for four or so miles, I had had it. I ran, pausing at drinks stops, but without any speed. The splits below tell the story. I made it to the end with absolutely nothing left. I was not disappointed, but I do not think I will do Brighton again. There are too many parts of the course in which, like laboratory rats, we are sent running in one direction and then back on ourselves. 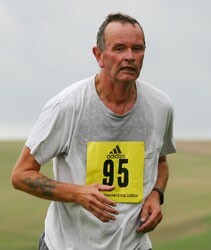 And it is a road marathon, better for fast runners, but I'd rather be on the downs. As chance might be, when I returned to the car, there was a leaflet for the Three Forts marathon under my windscreen wiper. Perhaps next year? In the meantime I shall take a week's rest from running, return to swimming training on Saturday, and plan my summer campaign of shorter distance races. This morning I went to the marathon exhibition, not to pick up my number, which I already have, but to browse, to admire exhibition stands selling jacuzzis and beetroot-based energy gels. I took two pace bands, one for a 4;30 finish, one for 4:45. It was a great pleasure to run into former BSMS runner, Claire Rank, now proud proprietor of Crank personal training. I watched a display showing the course and came away. I have prepared and packed all the kit I'm taking. I rely on a checklist prepared by Running Commentary. So, the die is cast. Alea iacta est. Apart from the chance to wander up the byways of the biomedical literature, another advantage of my current job is that I travel. This stops me becoming stale, and offers the opportunity to listen to the radio while on the move. I'm usually a Radio 3 listener, but this morning I happened to turn on Radio 4 hear Kathleen Jamie on Woman's Hour. At one point she compared writers to athletes: each has their preferred forms, or distances. She, a poet and essayist, is a sprinter. I suppose writers of novellas and short stories are middle distance runners, while marathoners undertake the great long novels of the nineteenth and early twentieth centuries. Or, in verse forms, a marathon might be a Homeric epic in twenty-four or even twenty-six books. I find it interesting to think of Sunday's marathon as a large-scale work of art, but what should it be? I think less a work of literature, perhaps more a dance, as Julia Armstrong and I observed in her podcast the other week. Or maybe a work of music, an opera or a symphony of Mahlerian or Brucknerian proportions. So I shall run on Sunday in four movements, each approximately 6.55 miles, a first movement, a slow movement, a scherzo and a finale. This is not a simplistic attempt to dictate pace, a mechanistic allegro, largo, presto then allegro, but more a way to think about the different phases of the race. I will report back on how this works in practice. First movement: start to the new sewage works in the middle of the A259 (on the way out...we also pass these on the way back from Ovingdean). if in sonata form, then the exposition would be the first two miles, the development the middle two or three, and the finale the final mile or two. Then again, perhaps it should be an experience that brings together many art forms. I doubt if Wagner would recognise his concept of the Gesamtkunstwerk in the spectacle of a few thousand runners on the streets of Brighton, but it makes sense to me. I hope there were none among the runners who fell by the wayside during Brighton's second marathon who suffered Pheidippides' fate. In the heat, the first-aiders did seem to have plenty to keep them busy. Nevertheless, fuelled by the water and energy drink stations, and many jelly babies offered by spectators, I finished my eleventh marathon in 4:46:52 by the chip. At the moment, I can't report the times of my other Seaford Striders, as the results don't yet allow one to search by anything other than name or number. I can say however that among assorted internet running comrades, MarathonDan, who ran as a 9 foot tall stick of rock, finished in 4:43:17, and Fit Artist managed 4:50:28. It was a splendid day; the support from the crowds was tremendous, and made up for some of the harder stretches. Miles 1-5, from Preston Park to Kemp Town: I was running too fast here; each time I checked my pace I realised, and tried to rein it in, but it crept back up. Looking at my mile splits, I was doing 9-minute miles up to mile 8. Miles 6-10: Kemp Town to Rottingdean: harder work, as the heat increased. This stretch includes the only hills on the course, which are not substantial. Ovingdean village laid on a brass band, a pleasant change from the samba bands that made up most of the musical accompaniment on the route. Here my pace was as it should be. Miles 11-15: still on target as far as pace was concerned, and this stretch brought us back along the sea front past the finish. Here the pavements were dense with spectators. I remember in particular a steward with a megaphone who had become quite unintelligible with excitement, and Sweder of Running Commentary, whose voice rang out above the fray as Ajax's in the melée outside the gates of Troy. Miles 16-20: here it became difficult. There was a long drag out and back through Hove, well-supported but the slog to the turn seemed to last forever. I stuck it out, but at the end of the return trip, as we turned towards the front and Shoreham, at eighteen and a half miles, I had to stop running and walk. I had had pain in the toes of my left foot for more or less all the race, and now this was joined by knee and shoulder pain. For the next four miles or so I walked and ran, walked and ran. Miles 21-26: when I reached mile 22 I forced myself to start running, and though I was often tempted to stop and walk again, the shame of doing so in front of so many supporters kept me going. Looking at my splits, I see that I was back on target pace for the final mile, which pleases me. Will I run a marathon again? I'm uncertain. I trained as well and assiduously as I could, certainly as well as for the Isle of Wight in 2006, when I recorded a personal best for the distance of 04:10:40, and yet I ended up walking part of the course. In 2006 I was a callow youth aged 51. Now I am a knackered has-been of 56; perhaps I should grow old gracefully. After London in 2009 I said never again; I wouldn't rule out another marathon, but perhaps not for a while. On a happier note, thanks to everyone who supported me, on the course, on Twitter, and by sponsoring me for the Moorfields Eye Hospital Development Fund, and if you haven't, perhaps because you didn't believe I'd finish, now's your chance.